Northwestern University and the Department of Energy’s Fermi National Accelerator Laboratory have established a new collaboration that will enhance the world-class discovery that is a hallmark of each institution. The Center for Applied Physics and Superconducting Technologies (CAPST) formally recognizes a broad intersection of scientific pursuits and complementary state-of-the-art facilities. CAPST lays the groundwork for the cross-utilization of technical expertise, facilities, and equipment and establishes a partnership that will foster joint scientific research, mentorship, and new opportunities for researchers, graduate students, and postdoctoral fellows. Research at the center will include a focus on advancing superconductivity, which is expected to produce societal gains in the fields of particle physics, solid-state physics, materials science, medicine, energy and environmental sciences. Superconductors are materials that conduct electricity with no resistance, and superconducting magnets — like those used in magnetic resonance imaging (MRI) and particle accelerators — must be cooled to cryogenic temperatures during operation. In its superconducting state, these devices can conduct much larger electric currents than any ordinary wire, creating intense magnetic fields. The breadth of research at CAPST will further investigations into the upper limit of performance of superconductors for next-generation particle accelerators, help develop superconducting devices for quantum information science and technology and expand the frontier in superconducting materials. Walsh’s colleagues at Fermilab agree, expressing enthusiasm about the prospects of the partnership. Fermilab is a world leader in the field of accelerator science and technology research, in particular for radio-frequency superconductivity and high-field superconducting magnets. 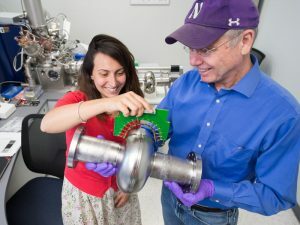 These technologies enable large- and small-scale accelerators with applications ranging from particle physics to solid-state physics, including materials science, biology, medicine, energy and the environment. The collaboration is already paying dividends, with Northwestern having been awarded a research grant for CAPST from the Physics Division of the National Science Foundation (NSF). A large variety of SRF cavities are used in particle accelerators. Fermilab produced its first high-energy particle beam on March 1, 1972. Since then hundreds of experiments have used Fermilab’s accelerators to study matter at ever-smaller length scales and investigate physical processes thought to take place in the early evolution of the universe. Anna Grassellino, CAPST co-director and a Fermilab physicist, is working to develop SRF cavities with improved performance at lower operational costs. Her research on nitrogen doping of niobium SRF cavities was a breakthrough discovery that led to a major improvement in the performance (quality factor) of SRF cavities. 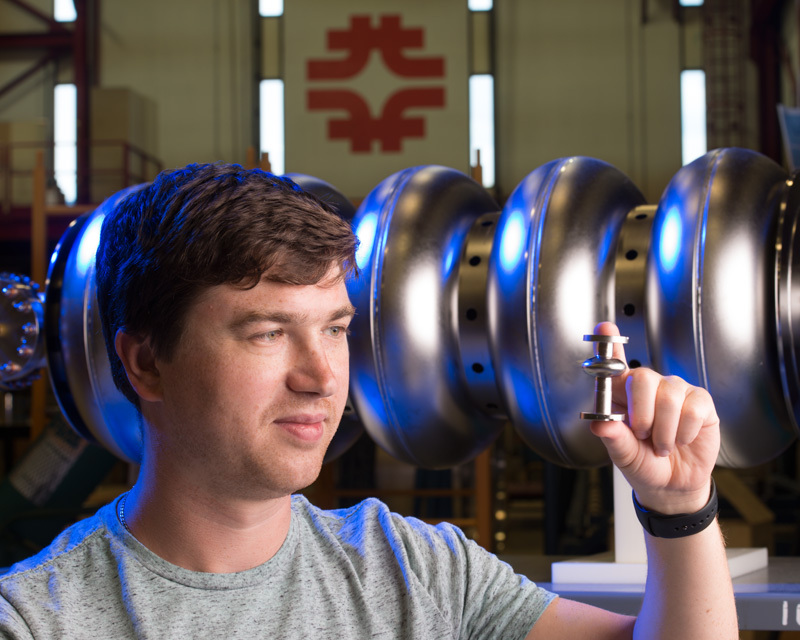 The Fermilab results have been adopted as the standard for SRF cavities for particle accelerators used in other research and industrial laboratories worldwide. 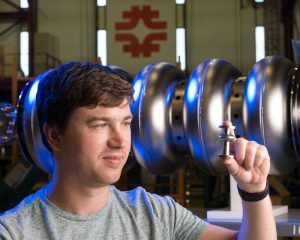 The research is expected to enhance superconducting accelerators used for a broad spectrum of scientific machines, medical devices and nuclear energy applications. Northwestern faculty Venkat Chandrasekhar, William Halperin, John Ketterson, Jens Koch and Nate Stern, all physics and astronomy, as well as David Seidman, materials science, will lead various research efforts within the center. Eight Fermilab staff members, including Anna Grassellino and Alexander Romanenko, who hold adjunct appointments in physics and astronomy at the university, are part of CAPST. Members from each institution meet in person at Fermilab and Northwestern about twice per month, also using SMART electronic whiteboards and video communication to share information digitally. In addition to SRF accelerators, the center will foster research and collaboration in the rapidly developing research field of quantum computing. Romanenko is leading the new SRF-based quantum computing architecture effort at Fermilab, and a new subkelvin dilution refrigerator will be installed in the fall to begin experiments. Koch, director of graduate studies in Northwestern’s Graduate Program in Applied Physics, is an expert in quantum electronics and superconducting quantum circuits (SQC). Quantum computing based on SQCs takes advantage of the preservation of information provided by superconducting circuit elements. There are major efforts under way at universities, places like Google, Microsoft, IBM and Northrop-Grumman, and national laboratories to develop the next generation of computing machines based on quantum logic elements. CAPST will pursue superconducting based quantum circuits.